Solgar D-Ribose Powder 150 g contains the monosaccharide (sugar) Ribose. Glucose is a well-known sugar and it is used by the body for the production of energy. Unlike glucose, ribose, despite being a sugar too, is not used to provide energy, rather it is absorbed into the molecules which are used to transfer energy within the cells. During a process called the Krebs cycle, chemical reactions take place in the cells, converting carbohydrates, proteins and fat into energy. This energy is stored in a molecule called NAD (nicotinamide adenine dinucleotide) to then move the energy into another molecule called ATP (adenosine triphosphate). Ribose is a structural component of both NAD and ATP and therefore essential in the process of transferring energy within and between cells. During and after periods of strenuous exercise, both strength and endurance, one could benefit from an increase of both NAD and ATP as this will assist giving your cells the energy they need to perform and recover. 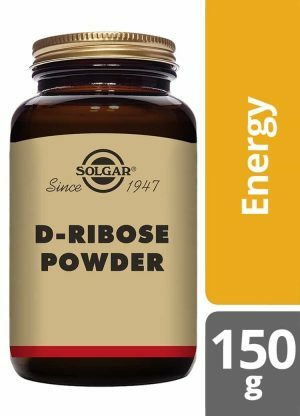 Solgar D-Ribose 150 g comes in an easy to use powder form which can be mixed with water (1 3 teaspoons a day), providing 150 g of this monosaccharide to assist energy transfers between your cells.